In a few months you'll just throw all the clothes into one load and hope for the best. 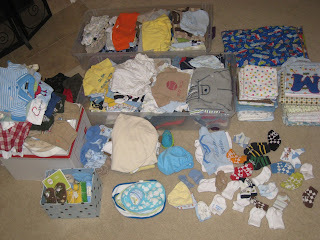 Still, that's a lot of baby clothes I carried back from California for little Gerry. Thanks to you and Mum and Dad for transporting clothes from the West Coast. It takes a village to clothe our baby. The sad thing is that if you have a beast like we do in Neil, you will blow through the early clothes in a matter of weeks! He is 5 months and he wears 12 month clothes. So many cute things I had for William, I will never see on Neil. They will look good on tater tot though... more clothes to come!